If you’re buying Despicable Me costumes for a group you’ll need to get in early. As mentioned, these are very popular costumes and they’re selling fast. Sizes are available for adults and kids so hop online and find what you need, including accessories. Here are all the details you need about the characters and their costumes. 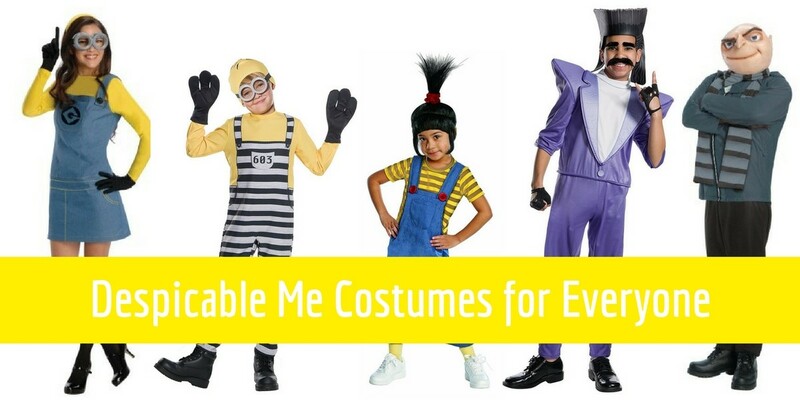 ⇒ Need Costumes from Despicable Me now? See them here online, click here. If you don’t know what Despicable Me is, then you’re really missing out on one of the funniest comedy movie franchises. This franchise gave birth to many laugh out loud scenes and endearing characters. 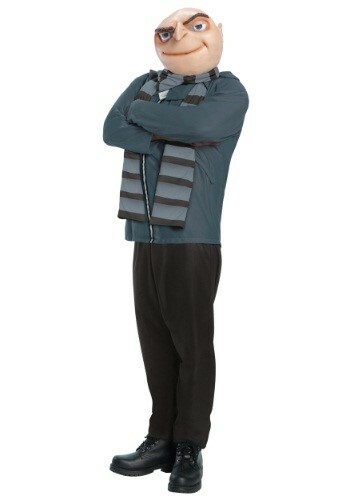 ⇒ For the price on this Gru costume, click here. Even the villains, rather than being ones that would frighten children, make them laugh with delight over their antics. The movies are based on the criminal mastermind known as Gru, which is played by the talented Steve Carell. In the first movie, he adopts some sweet little girls that he plans to use to further his criminal pursuits. But as he gets to know the kids and grows to love them. Gru becomes a better person. Gru is a hilarious criminal with an obvious soft side. You can find his costume for adults or teens and this outfit really does a good job of looking exactly like the one he wears on the big screen. Keep in mind that there will be some variances with the costume due to different manufacturers. One of the hallmarks of his costume is the latex mask. Not every costume will include this piece, but if you’re going to dress like him, you really do need it. This mask is rounded just like the character’s face, which gives him kind of an apple look. The mask also has extra-long eyebrows that are drawn into an arching frown. He has a long, narrow beak shaped nose and wide eyes. He has a thin, smirking smile on the mask. Some of the costumes for Gru feature a shirt that’s usually in a muted color. The pants are usually dark. In the movies, he wears a striped scarf and you’ll find that with most of the costumes. None of the costumes of this character include shoes. ⇒ See the price on this Balthazar costume, Click Here. One of the funny villain costumes that you can get is the Balthazar Bratt one. This costume is usually a brightly colored jumpsuit, gloves and the hairpiece. Some of them will also include the thick mustache and eyebrow pieces – but not all of them will. Some of the other characters that are wildly popular in the franchise are the minions. You can also find these for adults or baby, toddler and children sizes. ⇒ Want to see all the Minions Costumes now? See them here online, click here. There are also plus sizes available. Some of these costumes are inflatable ones while others are not. One minion costume features the jailbird look and can have goggles, a hat, gloves, and the jumpsuit. Another minion costume might be the jumpsuit overalls that the minions wear. You can find the Kevin jumpsuit for men or the dress jumpsuit for women. You can also get the Dave or Stuart minion costumes for men or women. Don’t forget your dog this Halloween! Dogs make great minions and as you can see there are adorable minion costumes for dogs too. Click the image to see the price on this dog minion costume. The little girls in the movie have some costumes as well. One of these is the Agnes costume. You can find these with the jumpsuit and some have the wig with the stand up hair included. ⇒ This Agnes costumes includes the wig with the stand up hair, her signature style. Click Here for the price. There are certain items that are essential if you’re dressing in a Despicable Me costume. Gru’s scarf, Agnes’ hair, minions’ eyes, these are all essential parts of the costumes. Here are some examples of accessories available online. Despicable Me costumes are definitely the most fun set of costumes for groups but they’re great for individuals too. Choose your favorite character, whether they be a good guy or a villain, and you’ll be set for Halloween this year. ☑ Looking for costumes from The Emoji Movie? Take a look at these…click here.